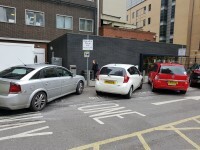 You are on Getting To (PET Suite). Skip to the next section. PET Suite is/are located on level R2. 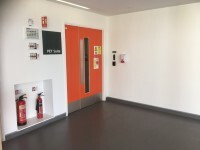 Access to PET Suite is via the centre entrance. On entering the Guy's Cancer Centre turn right and continue past the stairs taking the centre lifts to the Radiotherapy Village. 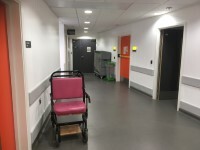 On exiting the lifts continue straight ahead and take the Radiotherapy Village Lifts to level R2, turn left on exiting the lifts and continue ahead through the R2 entrance. 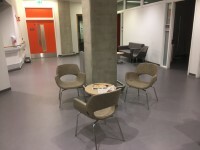 The suite is located in the corridor to the rear of level R2. 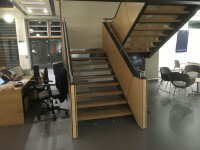 There is step free access, via lift, to PET Suite. 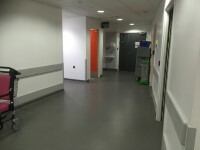 PET Suite is approximately 45m from the Radiotherapy Village 2 (R2) entrance. 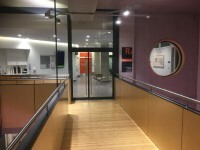 There is a/are manual, heavy, double door(s) between the Radiotherapy Village 2 (R2) entrance and the department/service. There is not a hand sanitiser. There is not a door release button when exiting. The width of the door opening is 223cm. 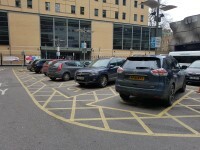 You are on Lift (Centre Lifts). Skip to the next section. 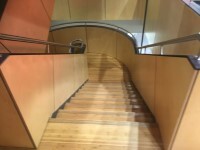 The lift is located to the right as you enter and straight ahead. 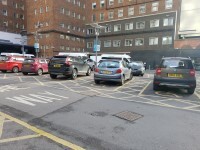 The lift is approximately 15m (16yd 1ft) from the Centre entrance. 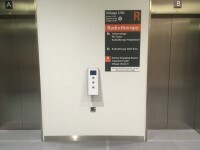 The floors which are accessible by this lift are Radiotherapy, Outpatients, Chemotherapy. The dimensions of the lift are 170cm x 200cm (5ft 7in x 6ft 7in). 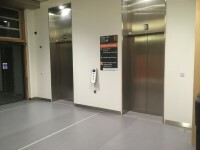 There is a list of floor services available within the lift. 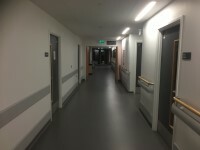 You are on Other Floors (Radiotherapy Village). Skip to the next section. 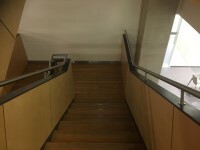 The floors which are accessible by stairs are R, R2. 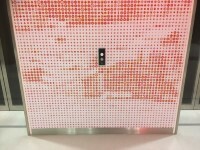 You are on Lift (Radiotherapy Village). Skip to the next section. 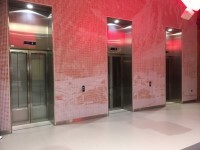 The lift is located straight ahead as you exit the centre lifts on R1. 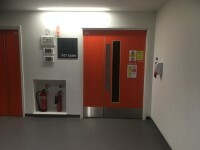 The lift is approximately 6m (6yd 1ft) from the Centre lifts. 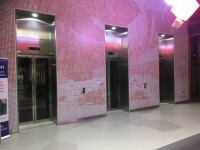 The floors which are accessible by this lift are R1, R2, R3. 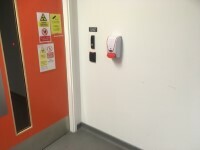 The colour contrast between the external lift control plate and the wall is fair. The dimensions of the lift are 201cm x 140cm (6ft 7in x 4ft 7in). 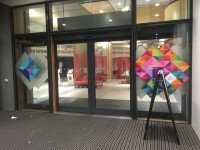 You are on Entrance (Suite Entrance). Skip to the next section. This information is for the entrance located On R2. The height of the bell/buzzer is 120cm (3ft 11in). There is a hand sanitiser. 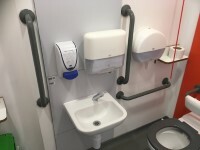 The height of the hand sanitiser is 115cm (3ft 9in). There is a door release button when exiting. 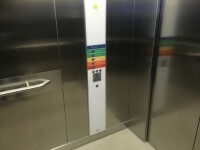 The height of the door release button is 112cm (3ft 8in). The width of the door opening is 87cm. 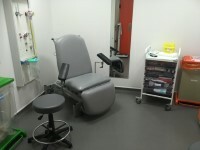 You are on Consultation / Treatment Room (Preparation Room). Skip to the next section. 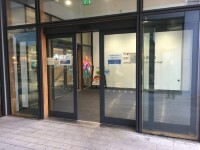 The width of the door opening is 130cm (4ft 3in). 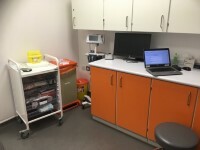 You are on Consultation / Treatment Room (Scanning Room). Skip to the next section. The width of the door opening is 115cm (3ft 9in). You are on Standard Changing Room. Skip to the next section. 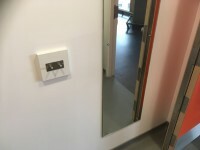 The standard changing room(s) surveyed is/are located to the right as you enter the suite. 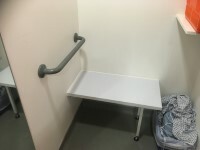 The standard changing room(s) is/are approximately 10m (10yd 2ft) from the suite entrance. 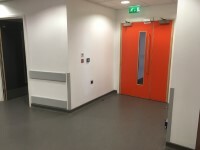 The standard changing room(s) is/are approximately 3m (3yd 10in) from the suite entrance. 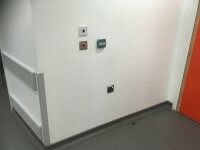 This accessible toilet is located to the left of the PET Suite Entrance. This accessible toilet is approximately 3m (3yd 10in) from the suite entrance. 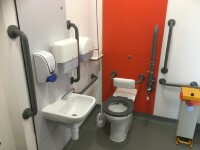 The dimensions of the accessible toilet are 154cm x 221cm (5ft 1in x 7ft 3in). The lateral transfer space is 87cm (2ft 10in). There is a/are clinical waste and waste paper pedal bin disposal units. The height of the coat hook is 105cm from the floor. The height of the soap dispenser is 101cm. To view other access guides that are related to this one please use the links below. Guy's Hospital Main Building link (new tab) - click here. 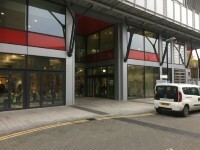 Guy's Cancer Centre Main Building Welcome Village link (new tab) - click here.